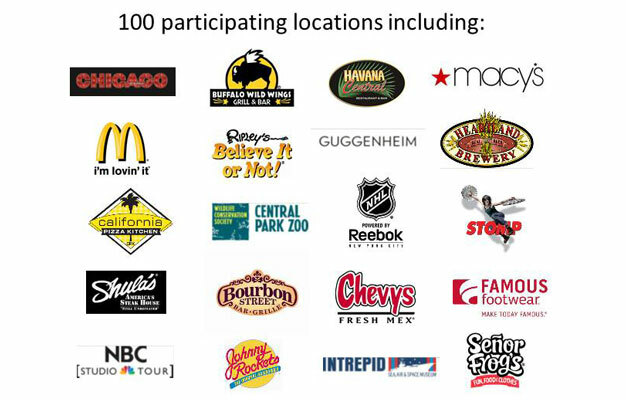 The Eat and Play Card is New York’s only discount card for tourists providing savings on virtually everything from dining to attractions and from shopping to shows. Just one card is valid for up to 4 people at 100 popular places in Manhattan. New York can be an expensive city to visit with dining out only, which often is a visitor’s single biggest expense! Luckily, there’s great and easy way to save money in New York with an Eat and Play Card bursting discounts. Whether you’re in Midtown, Uptown, Downtown, Greenwich, Chelsea, Little Italy, the Garment District or many other Manhattan neighborhoods, you’ll find great savings at places you love with Eat and Play Card. One card is valid for up to 4 people and is enough for an entire family or group and can be used up to 30 days. How do I get my Eat and Play Card? Shortly after your booking is complete your e-ticket will be sent directly to your email, just print it out and bring it with you to New York. Once in New York you need to redeem your e-ticket for your Eat and Play Card at one of the four centrally located addresses on Manhattan. The addresses will be on your e-ticket. How many can use the card? One Eat and Play Card is valid up to 4 persons. So if you are a group between 1 to 4 people, you only need to purchase 1 card. If you are 5-8 people, you need 2 cards etc. Where can I use my Eat and Play Card? You can see list of all the participating merchants HERE. How long is the Eat and Play Card valid? Your Eat and Play Card is valid for 30 days from the first time you use it. No, the Eat and Play Card is the same price for all. But remember, one single card can be used of up to 4 people.